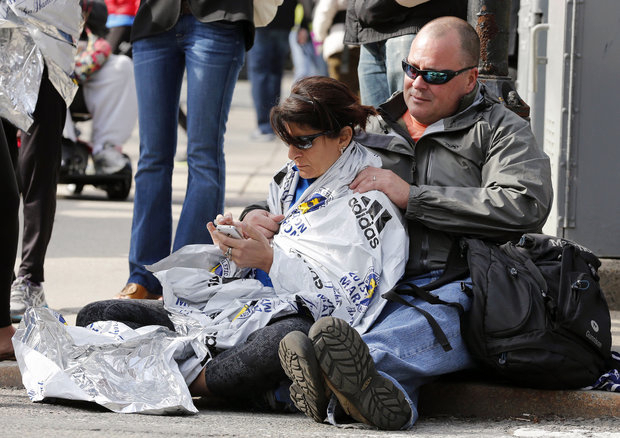 File: A marathon runner in Boston after the bomb attacks on April 15. Another shocking act of violence in sports. I’ve spent time in troubled places. I learned to be cautious about my surroundings as a student in Austin High School during the race riots of late &apos;60s and early &apos;70s. You never get used to it, but you figure out how to be safe. In 1981, I visited my sister in turbulent Northern Ireland. When we approached the border from the Republic of Ireland there was no sign posted indicating the divide. But several British soldiers stopped the car, pointed rifles to our heads and asked for our passports before we could proceed. We drove through bombed out Belfast and saw what hatred and violence could do to a city. I made a choice to visit Belfast even though knowing there was danger, but took all the precautions necessary to deal with the surroundings. But I never expected my safety to be in question at a sporting event. I was in Atlanta as a spectator at the 1996 Summer Olympics. My husband and I joined tourists from all over the world at Centennial Park on July 27. Less than an hour after we left, a bomb killed one woman and injured more than 100 more. The games continued with heightened security and increased military presence. It made us feel safer, but not completely safe. It changed my sense of safety surrounding major sporting events. September 11 changed it even more. Now there’s is no issue in my mind to having my bags checked and media credentials scrutinized. Technology is changing the way we view tragedies too. The Munich Massacre at the 1972 Summer Olympics is etched the memories of the people that watched the horror unfold on television. Who could forget Jim McKay giving the news about the murders of the Israeli wrestling team? But we didn’t see the carnage on our screens, and information and specifics took a long time to be revealed. The bombing at Monday’s Boston Marathon, like September 11, was viewed as it unfolded. Social media is a flurry of activity, spreading good information and bad. The iconic sporting event will now always be known for the bombing. It’s another sad chapter in sports. I wish we could close the book on these terrible incidents. But we can’t. We must think at every sporting event big or small: see something, say something.